Old, pure-opinion question — shall we delete it? [my paraphrasing:] Kids these days, amirite? and has all the answers you might expect. It currently stands at +82/-11 votes, closed in 2013 as opinion-based with 16 answers (four of which are deleted). I think it's the most opinion-based (undeleted, un-historical locked) question I've seen here and would like to delete it. Maybe I'm missing something, though. Thoughts? Many programmers seem content to learn some pidgin sub-dialect, and stick with that. If they see a keyword or construct that they aren't familiar with, they'll complain that the code is "tricky." What do the rest of you think? Am I right, or should we all be content with the typical level of programming language expertise? and a link to an image of the full question. It should be deleted, along with all other questions that are off topic. Bad examples, whether from 2008 or yesterday still set bad precedent – even when a question is Locked. It may be unpleasant to deal with skeletons but, unless they are dealt with, their putrefaction contaminates the living. We have chosen (I believe wisely) not to accept questions for example where answers can only be highly opinionated. The reasons for doing so are nothing to do with when a question was asked but with the likelihood of numerous, rambling answers with no corroboration and hence little merit. There are plenty of blogs where experts, or would be experts, rant or enthuse over their pet hates and fancies. We have meta for the borderline cases and for digression into a bit of fun. 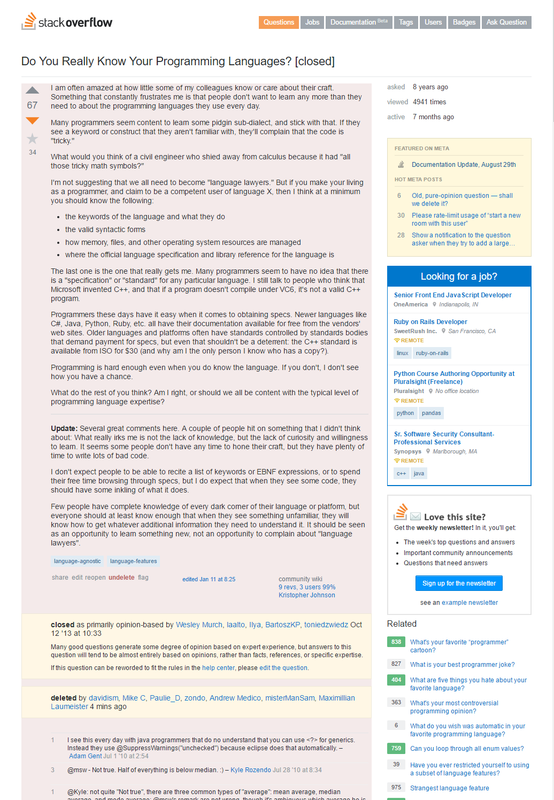 Nowhere I know of does it say "a practical, answerable problem that is unique to software development" only applies for questions since any particular given date. SO does not and should not preserve every word that is ever submitted to it. What started as a self-help group for a relatively small number of programmers has developed into a free code writing service for the lazy general public (with some exceptions!) that is declining in educational value due to sheer popularity. It is unrealistic to expect a questioner to find an answer to their problem (even if they know the right search terms, which they often do not) when I can't find it even if it was an answer I wrote. There is information overkill. It is far easier to answer a known duplicate than to find the post to refer to. It is far easier to get someone on SO to answer your question than to work your way through it mostly by yourself and learn in the process. Granted, the first, even also second, attempt might be painful, but by the third, if a third is needed, the OP can be sure either of a tailor-made answer to their very specific issue, or that some other user has trawled through 12M+ questions and managed to find a 'master' to dupe close against. Every opportunity to reduce clutter should be taken because though each individual useless post makes no difference whatever to the overall problem, millions of these together become a big problem. There are not many historically Locked posts, but they are far and away the most evident of those that do not further SO's objectives. Removing them is a step in the right direction. The post referred to here (now deleted) was not Locked, but in removing it a good second step in the right direction. Can/should “dead links” in locked posts be removed? Old, off-topic, locked, low views, low score - delete? Should I delete an old, unanswered question that I wouldn't ask again today? I've answered a question wrong. Shall I delete that post? Why was a flag to delete an old poll declined? Shall I delete an old recommendation question? Is this an opinion-based question?